PHILADELPHIA -- It's not every day a Rock and Roll Hall of Fame band tells you "nice work" on your drumming skills, but 10-year-old Daniel Krilov of the Holmesburg section of Philadelphia just had one of those days. 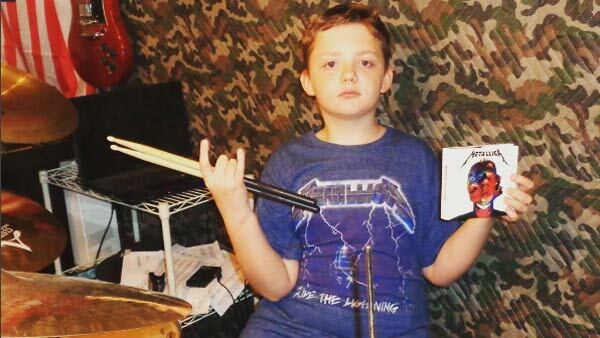 Even though Daniel was 13 years away from being born when Metallica released their first album, the avid drummer and School of Rock Philadelphia student is a huge fan of the heavy metal band. "He always liked rock music and became a big Metallica fan when I bought him Metallica's Ride the Lightning CD for $5," Daniel's father Andrej Krilov told Action News Sunday morning. Daniel says he only took up playing the drums two years ago, but wanted to learn since he was 5-years-old. "Because drums are loud and cool," Daniel said. Daniel began his drumming lessons at the Grisafi Music Institute in Bensalem, Bucks County, before recently starting at the School of Rock. "He loves the School of Rock because he's learning harder rock and metal music," Andrej said. Metallica recently released their first studio album in eight years, Hardwired...to Self-Destruct, and asked fans to send in videos of them covering the new songs. He posted a 1-minute video to his Instagram page last week, hoping Metallica would see it. Sure enough, Lars Ulrich and crew took notice. Not only did they like Daniel's video, they reposted it to their Instagram page this weekend. "Today's fan cover comes from @djkdrums and features the young drummer jamming on "Atlas, Rise!" Nice work dude!" Metallica wrote. "He couldn't believe when they liked the video, when they reposted it, he thought he was dreaming. Still super excited about it, keeps checking it to make sure it's still there," Andrej said. Right now, his father says Daniel wants to be a veterinarian and play in a band when he grows up. Daniel is already gaining a following thanks to his drumming videos; and if most of them have pets, he's off to a great start for both professions. The 'Atlas, Rise' video has over 300,000 views on Metallica's page in just one day. "He is very happy that so many people want to see him play," Andrej said. "Thank you Metallica for sharing my video. I will never forget this day. I got a lot of new followers and metal friends today. I hope you come to Philly next year so I can see you live," Daniel wrote on Instagram.